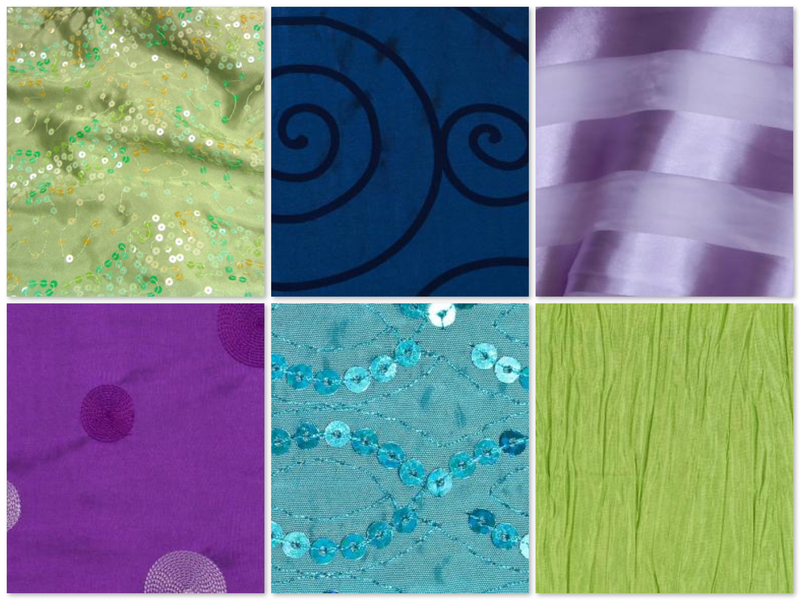 Here are a few pretty linen choices to help create your look! 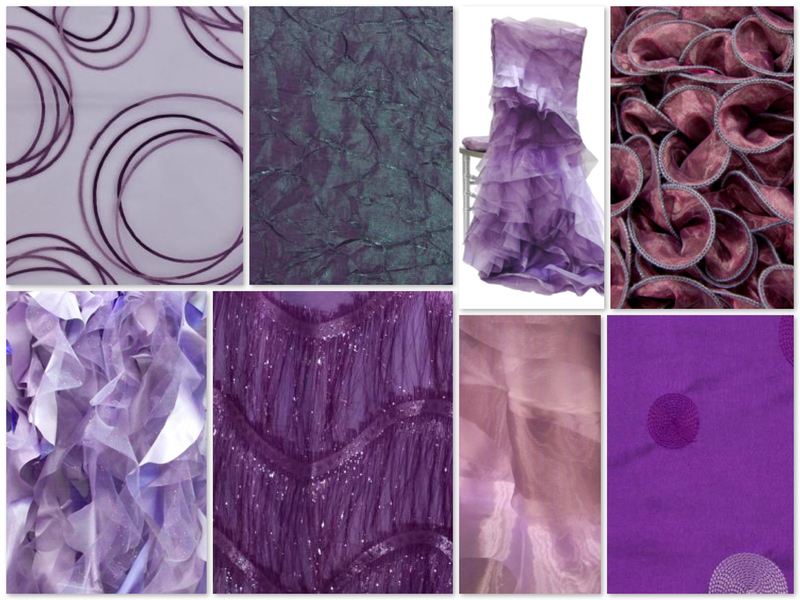 These are a sampling of our favorite purple linens that would look great for any peacock themed event! Green, blue and teal make a beautiful peacock linen palette. Sometimes the little details of a wedding can make all the difference. Paying attention to accessories like the guest book and ring pillow can really pay off in “wow factor”! If you don’t have the money to buy jaw dropping accent pieces you can make them! Making different things for your wedding lets you get exactly what you are looking for. Also, you will put a personal touch on your special day. 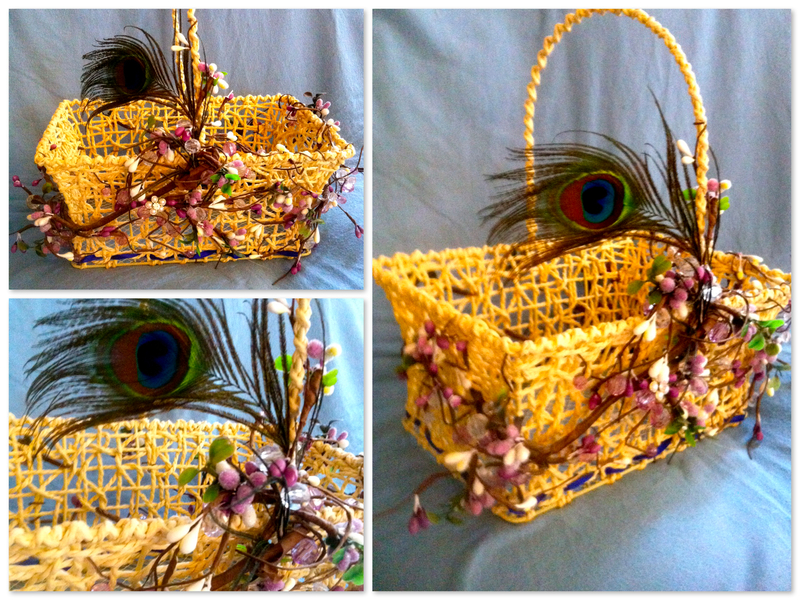 One simple craft project for you is to make your own flower girl basket. This DIY is simple because you start with a basket and build on the accessories. I chose a pretty string of garland with purple and pearl bead accents. I also bought one peacock feather. I also bought these at Michael’s for around $12.00. I used a royal blue ribbon that I had to weave around the bottom. I simply started by weaving the garland through the holes until it gave the wrapped effect I desired. You can zip tie the garland in place if you want to ensure that it won’t move! Next, I weaved in the peacock feather and bent it until it was at the angle I wanted. Finally, I wove a thin royal blue ribbon around the bottom to add more blue to the basket. So for about $20.00 I was able to make a unique flower girl basket! Much better than a boring one from the bridal store. There are so many different ways to create a peacock theme. This is primarily because there are so many beautiful and distinctive color peacock palettes. Usually bold, bright and fun, the color combination is always eye catching. 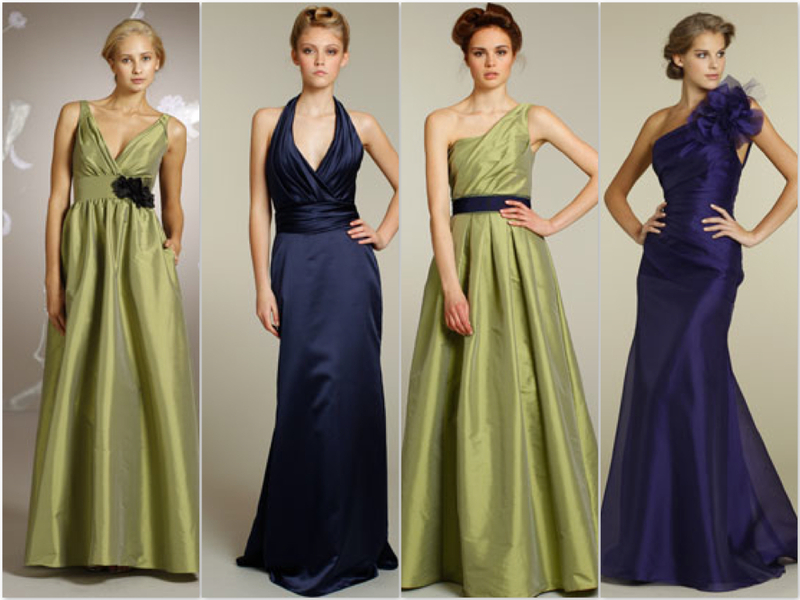 Sometimes all it takes to start creating your theme is to find a color palette you love. Sticking to a color palette also helps your décor look cohesive. You can always add in accent colors as you go; metallic colors like silver and gold make great accent choices! Check out some of our own peacock palette creations below. Check out our other peacock inspired posts and let us know what you think! 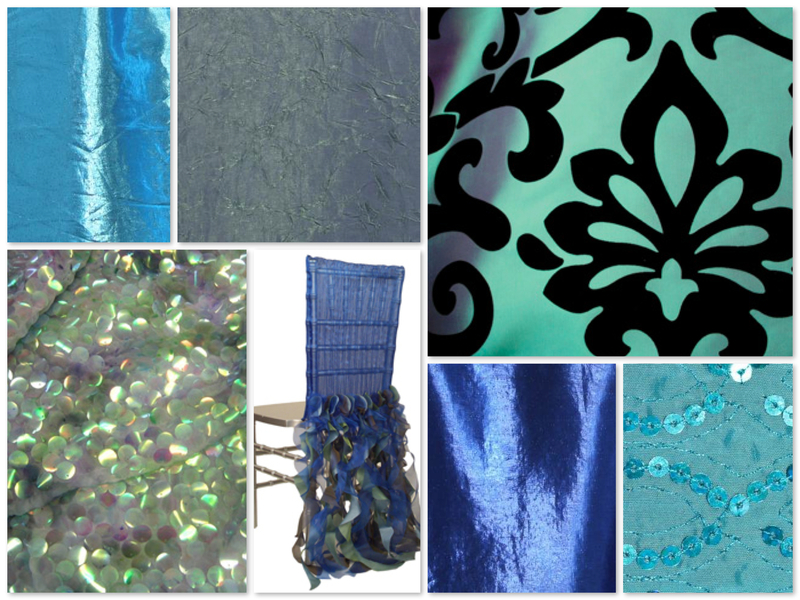 Participate in our poll and get your designs in for our peacock inspired linen contest. The winner of our contest will be featured on our Facebook! Also, follow us on twitter @TTTWeddings for more from Trends to Traditions! 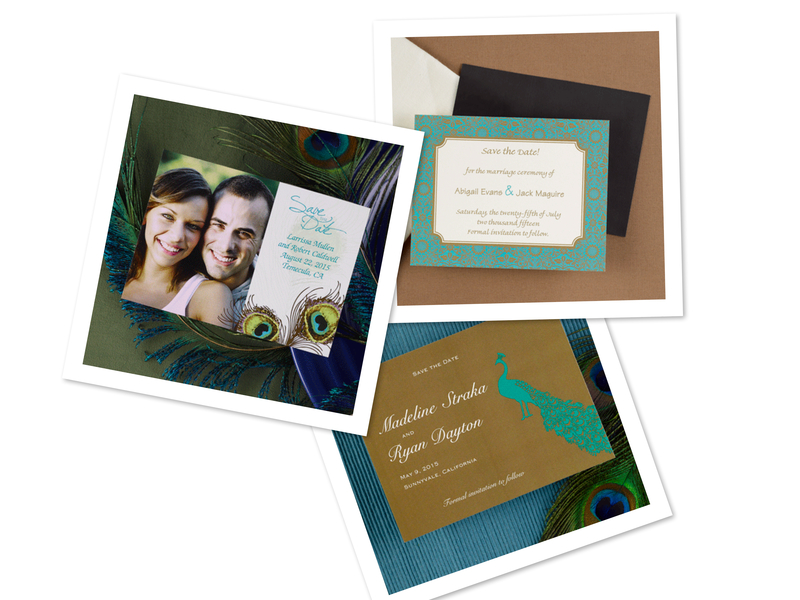 Peacock weddings are one of the biggest trends in the wedding world right now! And the wintery season is perfect to handle the rich tones and metallic accents that will pop against the contrasting snow on the ground. When creating a peacock inspired space, linens really bring the colors to life. Matching teals to deep purples and royal blues to hunter greens. Using our new Trends to Traditions’ linen tool you can create peacock inspired tablescapes like the one here! Think you can create a more elegant or fun peacock themed table with our linen tool? Give it a try and submit your creations to us! We will make a mockup tablescape using the winner’s design; winner selected at the end of January, so get your submissions in! Remember to be creative and different! Just select “email” once you’re happy with your design and send it to socialmediattt@gmail.com for your chance to be selected! And make sure to use Pittsburgh Linen Rental for all your linen needs! HOW TO: First select type of linen, like table or overlay. Then underneath the linen types is an arrow, select that and start choosing your linens!